Le Manoir de Lurin Villa is not your typical rental. Of course, it is larger than most with its 6 bedrooms and 7 bathrooms, but its real claim to fame lies in the extras here that you won’t find anywhere else. The living quarters are spread out over a main house and three bungalows, so there is lots of additional privacy for your group. Kids will be happy with the playrooms and games here, and the adults will love the classy and comfortable indoor and outdoor living areas where the whole group can gather. There is a large pool and a gazebo for outdoor relaxing, and the ocean views from the villa are incredible. You are also close to beaches, restaurants, and more when you stay at Le Manoir de Lurin. Breatktaking views of the ocean and just minutes from the beach! 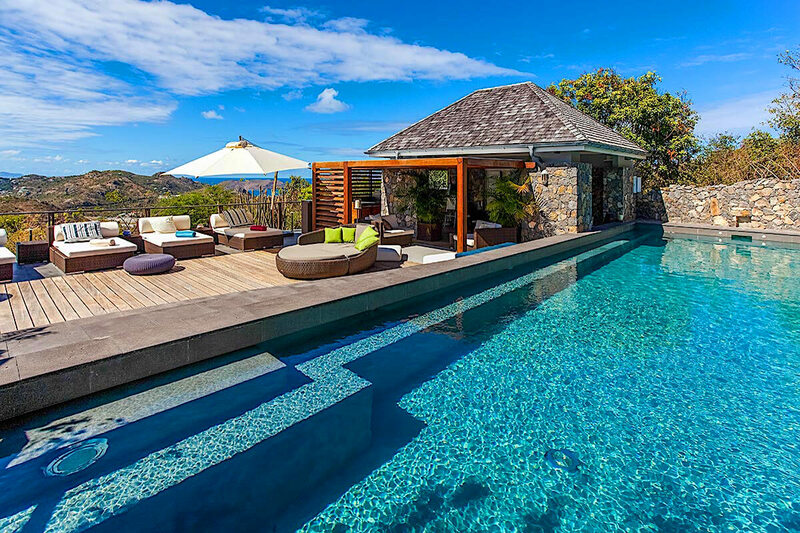 Located in the cliffs of Saint Barthlemy, with great views of Saint-Jean below, Le Manoir de Lurin is an exceptional 6-bedroom, 7-bathroom family property with expansive landscaped grounds. The fully enclosed garden plays village square at the heart of this charming escape, composed of a main house and three bungalows. Each abode has its own distinctive personality with just the right blend of island authenticity and up-to-the minute amenities. With one of Saint Barthlemy’s largest private gardens, the villa ranks high among the island’s most desirable holiday properties. It is the ideal choice for a large family or a group of friends vacationing together, where the separate accommodations give everyone lots of privacy while still being on the same grounds. Plantation Suite excepted, Le Manoir de Lurin’s other bedrooms can be found in the three bungalows, each equipped with their own kitchens and offering separate quarters for the children, comfortable accommodations for the nanny, and guests. The main house and the bungalows are all equipped with a wireless, high-speed Internet connection, flat-screen TVs and DVDs, as well as Bose stereo and iPod docks. Daily continental breakfast is included in the rates. 5 minutes away from Gouverneur. Guests will be met at the airport/car rental area and escorted to the villa by a local representative from the villa management company.